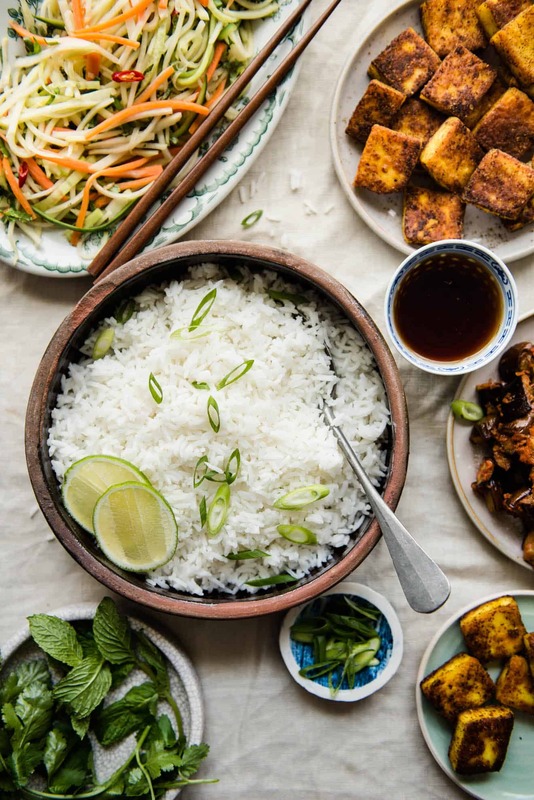 You don’t need to go to a restaurant to enjoy coconut rice. 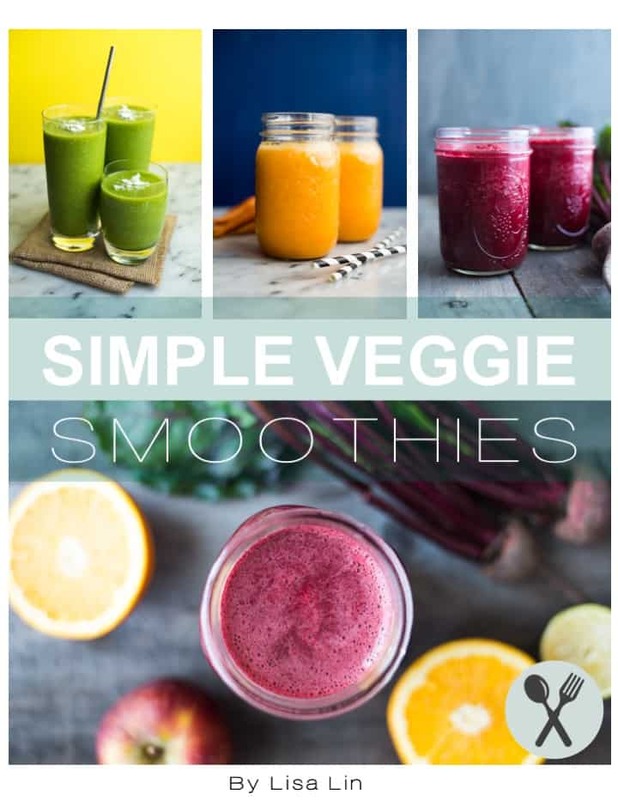 Make it at home in less than 30 minutes. It’s great with a side of my sambal potatoes or General Tso’s brussels sprouts. 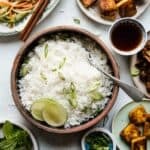 Coconut rice is one of those items that I often see in the menus of Asian restaurants but never bother to make at home. There’s really no excuse because it is so simple to prepare. Essentially, you boil rice with a mixture of coconut milk and water. That’s it. I’ve tested many different coconut milk to water ratios for this recipe, and I liked using 1/3 cup of coconut milk to 1 cup of water the most. I thought there was a good balance of coconut fragrance in the rice without the rice being too decadent. There are a few recipes online that recommend adding 3/4 cup coconut milk to the rice. I tried using that amount of coconut milk and found it to be too much. When I ate the rice, there was a slightly unpleasant feeling of coconut cream coating my mouth. Sure, the rice tasted richer, but I simply couldn’t eat too much of it at a time. 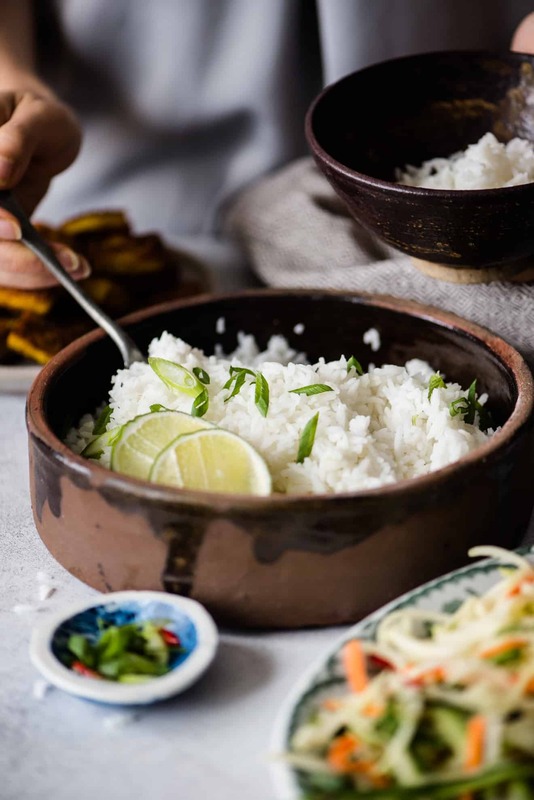 Hint of lime: Lime flavor compliments this coconut rice very well, so I highly recommend mixing 1 to 2 tablespoons of lime juice to the rice to brighten everything up. You can infuse even more lime flavor by adding the zest of 1 lime into the rice. Add it before you start cooking the rice or after the rice is cooked. Note that if you cook the rice with the lime zest, the rice will pick up a faint green hue. Letting the rice rest, covered: Once you turn off the heat for the rice, let it rest in the saucepan, covered. Because we’re cooking the rice for only about 8 to 9 minutes, we need the residual steam in the saucepan to finish the cooking process. That’s why it’s crucial to leave the lid on. 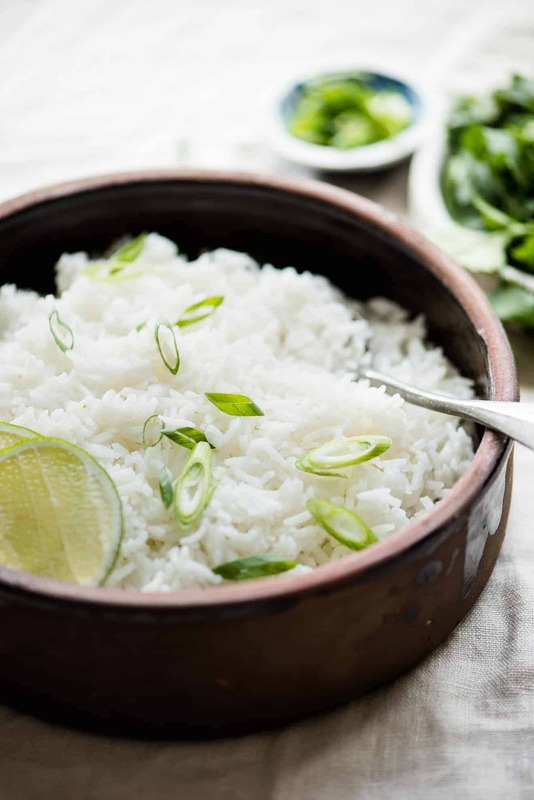 To infuse the rice with more lime flavor, zest the lime and add it to the rice either before or after the rice is fully cooked. Rinse the rice several times and transfer it to a saucepan. Add the coconut milk, water, and salt and give everything a stir. Bring everything to boil, uncovered. Reduce the heat to low, cover the saucepan and cook for 8 to 9 minutes, until the water has been absorbed by the rice. I usually transfer the saucepan to a burner with a smaller flame so that the liquids don’t absorb too quickly. Turn off the heat and let the rice sit on the stove for 10 to 12 minutes. Uncover the saucepan. You’ll notice a layer of coconut cream at the top of the rice, and that’s perfectly normal. 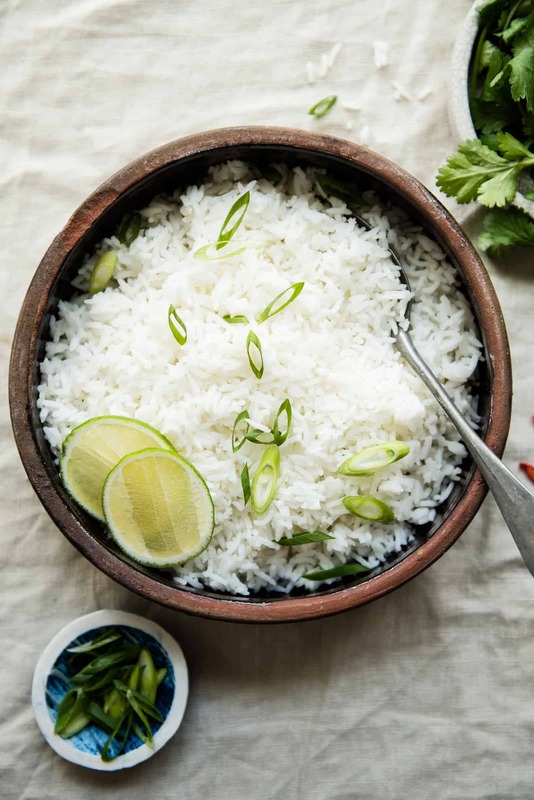 Fluff the rice with a fork and stir to distribute the coconut cream. Add the lime juice to the rice and stir again. Taste the rice and add more lime juice, if necessary. Serve the rice with your favorite dish. I love eating the rice with my sambal potatoes. ooooooooo. LOVE coconut rice! Thanks for the recipe!! Think I can use my rice cooker? 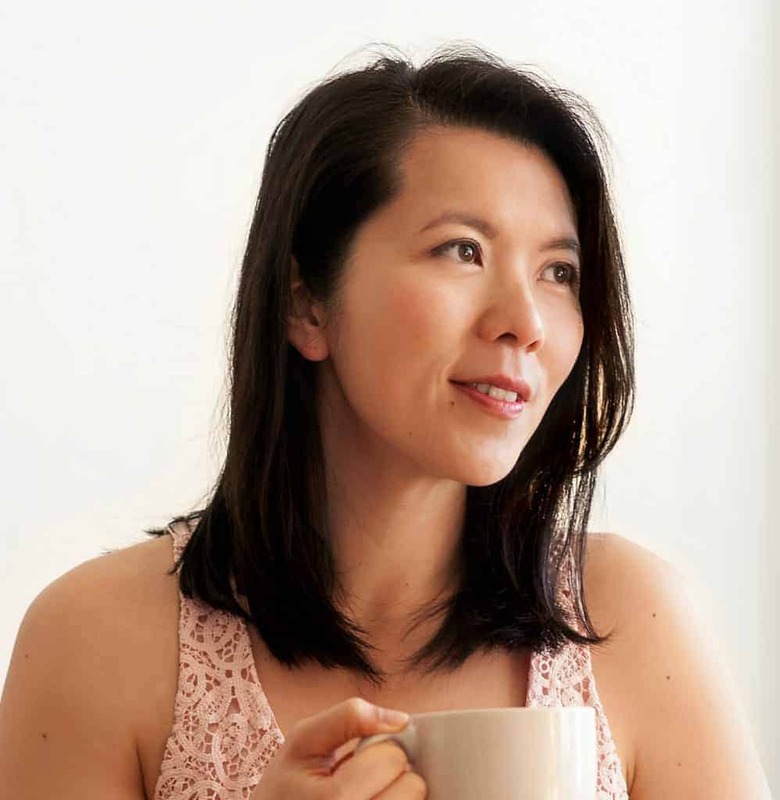 the ratio of rice to liquid is different…. Hi, Dawn! They are the green papaya salad! That recipe is on the blog, too. For the photo in the coconut rice post, I sliced the green papaya on a mandoline and then julienned the slices. Great! Thanks so much, Lisa!